A year after Bowery Lane Bicycles opened, Michael Salvatore, chief officer of just about everything, was brought on board to help run the business. His first task was to get the company operating and communicating on a more professional level by implementing Google Apps so everyone had @bowerylanebicycles.com email addresses. From experience at previous companies, Michael knew that email addresses were only the beginning and started using Google Apps to improve other business processes. He shares with us how this was done. The new "Find a Time" tab on the event scheduling page lets you view your coworkers’ schedules at-a-glance and choose the best time for a meeting. This is especially helpful for scheduling events with a large number of attendees, particularly if they are spread out geographically. Also in the event scheduling page, we’ve launched a simpler interface for setting recurring meetings with a small window that appears when you select the “Repeats” check box. For Google Apps customers with the administrative control panel option set to “enable new pre-release features” users will automatically see these new changes to the event editor. We’ve also made a number of changes on the back-end that improve the performance, consistency, and extensibility of Calendar, which we’ve announced on our Gmail blog today. Enjoy your meetings, now with fewer time zone scheduling hassles! Update (8/30): While rolling out the new calendar features last week we identified a potential issue that caused us to delay the update. We are working to launch these new feature to users on domains that do not utilize the Google Calendar Connector (GCC) service early this week and we are working on supporting GCC users in the near future. Collaborating with colleagues from various teams in different offices is a daily facet of my work. I am based in Zurich, Switzerland, and many of the people I interact with are in California, USA, which is nine hours behind. Oftentimes I find myself invited to attend meetings that happen late in my evening, which proves that coordinating across time zones can be a challenge. At Google we want to help you maintain a healthy work/life balance, so today we’re launching a set of new features that will improve your experience whether you’re scheduling across time zones or just across the hall. on Sept 8th to learn more about this feature. Here are a few examples of the wide range of applications that offer Gmail contextual gadgets in the Marketplace. Customer management (CRM) solutions are one of the most sought after applications in the Marketplace. The newly launched Solve360 contextual gadget demonstrates the advantages of having access to CRM information within a message. Alongside each Gmail message, Solve360’s gadget shows off a clean, at-a-glance view of everything your team knows about the person behind the message. Before taking further action, you can examine the customer’s previous interactions and special considerations. Advanced customer management is now no more complicated than a few extra clicks inside an email exchange with a client. Tracking time can be quite cumbersome for employees and businesses, so Harvest has developed a web-based solution for managing your timesheets. With Harvest for Google Apps, entering time is as simple as filling out a timesheet right within Gmail. Harvest sends automatic reminder emails to employees to fill out relevant timesheets. With contextual gadgets, these emails display the recipient’s timesheet right below the body of the message so users can fill out and submit their timesheet without ever leaving their inbox. Bringing this crucial task right into your email takes out unnecessary steps and helps you save time and stay on track. Smartsheet, a popular project management solution, offers integration across various Google Apps products. With their Gmail contextual gadget, any email that references a Smartsheet item allows task management right from your inbox. This functionality is interactive with your daily needs - as Smartsheet tracks project progress, if it detects a change in status based on your parameters, it will deliver an email to your inbox. Right from that email, you will be able to fully assess and edit each aspect of the project. The volatility of project management just got that much smoother. Gist demonstrates how deeply rooted and useful social networks have become. This application delivers social media in a way that changes how you manage relationships. Gist removes the noise from individual email alerts, eliminates the hassle of going to multiple services for updates, and automates the delivery of the most important information about the contacts in your professional network. With their Gmail contextual gadget, you can better understand the context of each email without any extra work and better frame your actions. Valuable social information is available to you exactly where you need it - your inbox. Remember to sign up for our webinar on Sept 8th to learn more about these great gadgets. The email inbox has become the hub for most people’s business day. With Gmail contextual gadgets, available in the Google Apps Marketplace, instead of having to open additional applications to take action or get more information, these applications intelligently bring what you need right into your inbox. Gmail contextual gadgets scan for triggers, such as names or purchase order numbers, within a message and present relevant actions in-line with the email. Attend our webinar on Sept 8th to learn more about this feature. Here are a few examples of the wide range of applications that offer Gmail contextual gadgets in the Marketplace. and new features like horizontal navigation or global footers, you can easily create a site for your team or project and share it with your colleagues, your entire organization, or the world. We've also seen small and medium sized businesses use Google Sites as a fast and convenient way to build their official web site. Combined with Google Places, Google Sites is a great way for small businesses to start building their presence on the web. To learn more, see our blog post on the Google SMB Blog or go straight to the Getting Started Guide for Google Sites and Google Places. 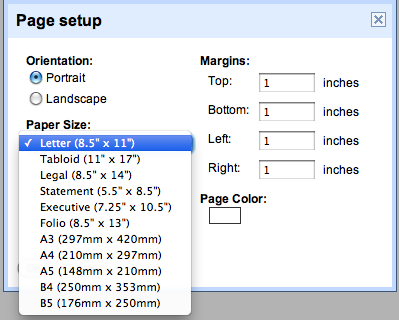 Google Sites makes creating a website as simple as editing a document. With dozens of site templates and new features like horizontal navigation or global footers, you can easily create a site for your team or project and share it with your colleagues, your entire organization, or the world. Over the past couple of months, thousands of businesses have added their Gone Google story to our community map and even more have used the Go Google cloud calculator to test drive life in the cloud. To highlight some of these companies’ Gone Google stories, we decided to talk to Google Apps customers across the United States. Check back each week to see which state we visit next. To learn more about other organizations that have gone Google and share your story, visit our community map. "The idea for Secretary in Israel came about when an entrepreneurial friend of mine in San Francisco told me how overwhelmed he was with all the administrative work for his IT business. He struggled to find a talented assistant within his price range locally. I introduced him to my friend who had just moved from the US to Israel. Not long after, he called to tell me that she was the best assistant he had had in years, and he encouraged me to start a business to provide this same service to other entrepreneurs. As a result of his encouragement, we started Secretary in Israel approximately two and half years ago. At the time, we were in an unusual situation: our virtual assistants, all of whom are American college graduates, were living in Israel, and our client base of successful entrepreneurs were spread throughout the United States and abroad (including the UK, Australia, and Thailand). With our team located thousands of miles from our clients, we were, as you might say, “geographically challenged”. One particular benefit that our virtual assistants and clients love is the ability to edit docs and spreadsheets simultaneously. Gone are the days of worrying about who has the right version of a document and whether the hours of changes you’ve just made were put into the right version or not. With Apps, the document or spreadsheet is always current, and our team and clients can rest assured that important edits were entered in the right version. Because of the collaborative focus of Google Apps, we’re able to run a business that provides a great service to successful entrepreneurs in the United States and abroad as well as career opportunities for professional, Americans in Israel." In Massachusetts, we find Sean Leach, Systems Architect for EPS Communications — a strategic marketing firm near Boston. With experienced staff, EPS marries multiple disciplines to offer client services including direct response media, interactive development, design, and custom content and publishing. EPS is so excited to have gone Google that Sean created the picture below showing each of his co-workers, and shared the story of why the company switched to Google Apps. 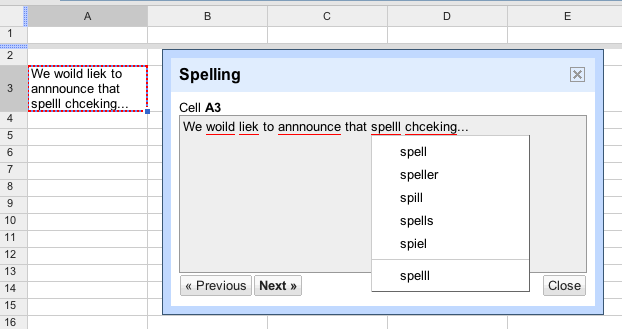 By using Google Docs, we’ve been able to help keep our projects on track and our teams working more efficiently. Everything starts as a Google document, often with multiple team members working on one at the same time. We can see who’s in the document and what changes are being made in real time. It’s collaboration at its best. We’re also able to organize and manage complex projects that have a lot of different stakeholders, like website redesigns. Our team will use a spreadsheet to list out which components of the website need to be updated, the corresponding owner, and the status of the updates. in first half of this year alone, the pace of innovation in Google Apps continues to accelerate. For more information on these new features in Google Sites, check out the Google Docs blog. This is a Labs launch, so to get started, click ‘Settings’ within Gmail, then the ‘Labs’ tab, and enable ‘Apps Search’. Standard Edition users can follow these instructions immediately, while Premier and Education Edition users will first need their domain administrators to enable Gmail Labs from the Google Apps control panel. For more information on Gmail labs for Google Apps, see the Help Center. Gmail makes it easy to find emails really fast with Google-powered search for your inbox. This works well when you know you’re looking for an email, but if you have information in documents and sites too, you may have to search several places with the same query to find what you’re looking for. Today we’re making it easier to search across more of your data with the new “Apps Search” lab in Gmail. Once the lab is enabled, the “Search Mail” button in Gmail will say “Search Mail and Docs” instead. When you run a search in Gmail, your search results will include matching documents and sites in addition to results from your email. (GEE), and with today’s release of GEE 4.0, we’re happy to announce support for two more important capabilities: mobile-based access to GEE systems, and Google Earth Enterprise Portable Solution. We’re also excited to let you know about the latest versions of the Google Earth Enterprise Client and Plug-in. to the Android Market. With GEE 4.0, the Android Google Earth client has been updated to support direct connections to customers’ globes, which permits their end-users to view their organization’s 3D globe, including all imagery, terrain, and vector layers, with support for custom vector search. Some of you might have heard during a recent Directions Media Webinar that many of our GEE customers need to provide their end users with access to geospatial data for situational awareness, even when those users are in environments with limited or no Internet connectivity. To support this, GEE 4.0 introduces a new feature that permits authenticated end users to extract portions of a published GEE globe -- including all imagery, terrain, vectors, KMLs, and search -- and serve the data locally from their own laptops or other storage devices using a native, cross-platform, light-weight Portable Earth System. Check out this video to see how the portable capability works. GEE 4.0 also has full support for the new Google Earth 5.2 client, with its many great new features, such as elevation profiles, native MGRS support, client-side data regionation, and the new embedded web-browser. In addition to performance improvements, the latest release of the Google Earth Plugin includes support for historical imagery databases and the ability to connect to multiple globes simultaneously. Existing customers can find GEE 4.0 upgrade information by logging into the Google Enterprise Support Portal. The Google Earth Enterprise team has long focused on bringing the innovative features of Google Earth and Maps to businesses, enabling them to create their own mapping applications from their existing data archives. Over the years we’ve released new features that have expanded the options for rapid, secure dissemination of geospatial data with Google Earth Enterprise (GEE), and with today’s release of GEE 4.0, we’re happy to announce support for two more important capabilities: mobile-based access to GEE systems, and Google Earth Enterprise Portable Solution. We’re also excited to let you know about the latest versions of the Google Earth Enterprise Client and Plug-in. and tried the #appsmarketplace, let other users know what you recommend via Twitter or submit your suggestion for additional apps. As your business grows, so does the complexity of managing projects, securing data, tracking resource usage, and communicating with coworkers. Today, we are excited to announce nine new installable apps in the Google Apps Marketplace that can help ensure that your business growth doesn't outpace your technological capabilities. So instead of patching servers and updating desktop-based software today, check out some of our more than 150 installable web apps available to Google Apps users. All of these installable apps offer single sign-on functionality so your users can start using them conveniently right from the universal navigation bar in Google Apps. Some have additional integrations with Gmail, Calendar, Docs and other apps, which makes these Marketplace apps more powerful than comparable stand-alone offerings. Google Apps Premier, Education and Standard Edition administrators can install Marketplace applications in a few simple steps -- watch this video to see how it works. Complex projects and tasks have a potential to grow out of control and lose focus, so we’ve included a series of project, communication, time, and task-specific management apps in this App Tuesday launch. DeskAway is a simple, yet powerful web-based project collaboration tool that streamlines the way you and your team work by giving you an accurate view of project progress and tackling some common problems that occur when multiple people are collaborating. Acunote is an online project management software. It helps you manage projects, products and requirements, track progress, realistically predict completion dates and analyze company productivity. RescueTime is an automatic time and attention tracker that helps teams work smarter. It is widely used by a range of companies and now has user and team sync for Google Apps accounts, plus a real time stats gadget in Gmail. ToBeeDo is an online task management service. The familiar, fast and intuitive interface helps you to organize your workflow and it doesn’t require any setup. Ketera is a network that simultaneously offers savings for business buyers and online sales opportunities for B2B suppliers to help members discover new trading partners and market insights, aiding in billions of dollars in transactions every year. FormLizard is for when you need paperwork completed properly. You and your customers can complete forms, contracts, and more online, giving you complete, accurate, legible, and professional paperwork every time. LumoFlow provides social collaboration workspaces for enterprises to manage projects, share documents and keep teams in sync. It also helps connect global business operations and manage joint projects with partners and customers. MangoSpring Collaboration Suite seamlessly integrates all the MangoApps to provide next generation collaboration experience. Each MangoApp solves an important part of the business workflow. Backupify provides secure, scalable, and automatic backup for your Gmail, Docs, Calendar, Contacts, and Sites. You can securely access and manage archives of backups from any web browser. We encourage you to explore some of these great new apps in the Marketplace. Join us next Wednesday when we hold a live webinar to discuss with a few of the app creators on maximizing your productivity with these apps. If you've #gonegoogle and tried the #appsmarketplace, let other users know what you recommend via Twitter or submit your suggestion for additional apps. Conference in San Antonio, Texas. The summit brings together leaders from the IT industry and government to discuss how to work together to mitigate the frequency and impact of cyber threats in the private and public sectors. Google will be participating in the panel discussion “Security in the Cloud” at 11 AM CDT. If you'll be at the conference, please join us for the panel discussion to hear about Google’s cloud security efforts. Additionally, you can find lots of information about the security of our solutions for enterprises here. On Thursday, August 12th, the Google Enterprise team will be participating in the inaugural Cybersecurity Summit at the CompTIA Breakaway 2010 Conference in San Antonio, Texas. The summit brings together leaders from the IT industry and government to discuss how to work together to mitigate the frequency and impact of cyber threats in the private and public sectors. Google will be participating in the panel discussion “Security in the Cloud” at 11 AM CDT. Users choosing to edit submitted responses will see their previous answers and be able to make edits, which will automatically be reflected in your spreadsheet and in the summary of responses. Whether you're ordering T-shirts for your team or planning a company-wide off-site, you no longer need to deal with shirt size or RSVP change requests in your inbox. By making it easy for users to edit their own responses, you can enhance the accuracy of your results while eliminating the need for manual updates. Users can edit their responses from the link in the form submission confirmation page or from the email confirmation, if one is sent. For more information, please see our Help Center documentation. Update 10/12: We've found a bug that affects the "Edit your response" feature in Google Forms, so we'll be turning it off until it's fixed. Sorry for any inconvenience, we'll keep you posted. I'm a big fan of Google forms because they allow me to quickly gather information from many people without clogging up my inbox. Whether it's a quick poll to a handful of coworkers or an in-depth company-wide survey, forms allow me to efficiently collect, organize, and store structured data without disrupting my email experience. Unless, of course, a user makes a mistake or changes his mind after submitting his response form. Those of you who regularly use online surveys know what happens next: emails begin to appear in your inbox asking you to manually update responses, defeating your attempts at efficiency. I’m happy to announce new functionality in Google forms available to businesses, schools, and organizations using Google Apps that solves this problem by allowing users to edit their own responses. Now, when you create a form, you will see the option to allow users to edit responses. We invited Kyle Swafford, Director of IT Services for Bergelectric, to share the story of Bergelectric’s evaluation of Google Apps and Microsoft BPOS-S and their subsequent migration from Novell Groupwise to Google Apps using Google Apps Authorized Reseller SADA Systems, Inc. Since our founding in 1946, Bergelectric Corporation has provided electrical contracting on thousands of construction projects for clients such as Phoenix International Raceway, the FBI, the University of Southern California, and Ritz Carlton Hotels. Bergelectric has more than 1,300 field employees and over 400 office professionals coast to coast. Our company had been a Novell Groupwise shop for many years, and IT staff had begun to feel increasing frustration with the platform due to its stagnancy. They were forced to dedicate substantial time and resources to maintaining servers across many sites nationwide. And we had to enforce email storage quotas of 100MB, though this amount of storage was often inadequate for users. Collaboration possibilities were practically nonexistent. In short, this aging environment wasn’t keeping pace with Bergelectric and this created a significant challenge for the organization. The choice to move to a hosted e-mail service was discussed passionately at every level of the company and marked a significant departure from the costly, and dated, infrastructure constraints of our on-premise system. After we made the decision to move to a hosted provider, we spent a considerable amount of time comparing offerings, including Microsoft BPOS-S and Google Apps. Initially we found Microsoft BPOS-S an attractive option, but as we delved deeper into the contract and piloted a production environment deployment we found the BPOS-S solution came up short - even with the significant concessions Microsoft made in order to be competitive with Google. For example, we were put off by the fact that we would have to go through a third party company for email archiving and retention. We soon came to the realization that we would have to invest significant additional time and money into BPOS in order to meet our initial expectations of migrating to the cloud. We decided to revisit Google Apps. For email archiving and retention, Google Message Discovery was easier to use, significantly cheaper, better integrated into the entire email migration process, and offered more features than the third party options available with BPOS. Once more, through the course of our lengthy evaluation, Google continued to update Apps’ functionality to incorporate virtually all of the features that we had valued in Microsoft’s offering. After updates such as Google Calendar Sync, which syncs events between Google Calendar and Microsoft Outlook Calendar, and the ability to delegate calendar management to an administrative assistant, we had reached the tipping point where users adamant about using Outlook became confident in the capabilities of the Google Apps suite. Our migration off the Groupwise platform has allowed the IT staff to focus its resources on more strategic, business-driven initiatives in the online space. The IT team has regained precious time previously spent patching and keeping the e-mail servers running and are now able to focus on things like business continuity and compliance. Employees have a generous 25 GB of e-mail storage and the ability access e-mail and collaboration tools from our many offices and remote project sites, whether it’s via a desktop, laptop or mobile device. We were impressed by Google’s commitment to making it easy and simple for long-term on-premise users to migrate to the cloud. And Google’s data liberation policy gave us peace of mind that, if we ever wanted to move platforms, we’d be able to readily do so. Once more, their commitment to open standards and APIs allow us to access our own data and customize our implementation in ways that we never thought possible. As our business needs evolve, we can find additional apps in the Google Apps Marketplace or we can easily build our own on Google App Engine. Overall, our employees have been extremely happy with the move to Google Apps. IT is relieved to finally have true redundancy, painless scalability and better control, all while no longer needing to maintain remote servers and tape backups. Management is pleased with the cost savings and vastly improved service offerings. Editor’s Note: We invited Kyle Swafford, Director of IT Services for Bergelectric, to share the story of Bergelectric’s evaluation of Google Apps and Microsoft BPOS-S and their subsequent migration from Novell Groupwise to Google Apps using Google Apps Authorized Reseller SADA Systems, Inc.